A plague called "The Blorbs" is inflating the Toads of the Mushroom Kingdom. Peach calls a council to solve the problem, but Bowser arrives. Mario defeats him, sending him flying into a forest. A mysterious figure gives him a Lucky Mushroom, granting Bowser the ability to inhale anything. Bowser returns to Peach's castle and inhales the entire council, including Mario & Luigi. The mysterious figure reveals himself to be Fawful, who succeeds in taking over the Mushroom Kingdom thanks to Bowser. Enraged by this deception, Bowser must work together with the miniature Mario brothers inside him if he is to defeat Fawful and restore his name as the real villain of the Mushroom Kingdom. There are multiple signs that parody Wii Fit, such as the Launch Fit, Slide Fit, and so on. The signs refer to them as "The Mushroom Kingdom's latest fad." The enemy Toothy uses an attack where it spits out the Blue Virus from Dr. Mario. Sockops are green, sock-like enemies based on the both the real-world pitcher plant as well as the Goomba Shoe (aka. Kuribo's Shoe) from Super Mario Bros. 3. When Luigi is later able to communicate with the Sockops, one reveals that its name is Kuribo. In the Fawful Theater, you can see dozens of Mario enemies in the seated audience. In the bottom-right corner of the room you can see a lone Shroob from Mario & Luigi: Partners in Time. It is also the only member of the audience you can interact with, although it only says "…"
Later in the game you can fight an optional boss battle by entering the Cold Room in Bowser's Castle. 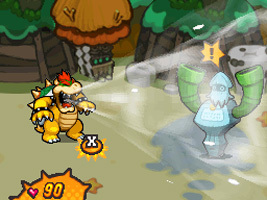 The battle is against three Shroobs, and various other kinds of Shroob can be seen in the background. This is based on the poor English phrase first seen in Pro Wrestling on the NES. The Toad in Toad Town who teaches you about digging up beans uses the phrase "It's a secret to everybody". This is a well-known phrase used by characters hidden in secret caves in The Legend of Zelda on the NES. In the Fawful Theater, there is a brainwashed Goomba who is trying to remember who he used to work for, listing off words that rhyme with "Bowser". One of the names he suggests is "Mouser", who was the first boss in Super Mario Bros. 2.